Does your camera have a focus problem? Chances are, if you have not adjusted the rear mirror stop your camera is properly focused, but you already know that some things are not right. Phil Askey the owner of dpreview, has stated that the backfocus problem is overblown and I have come to agree with him to a certain degree. Autofocus as designed by Nikon was meant to be done by a computer in the factory using a test bench and the mirror stops are arbitrarily set to mid positions and can be used for field adjustments. The two methods interact. If a camera has been manually adjusted and goes back for repairs and one of the repairs is to adjust autofocus, it will not be adjusted at the mirror but in the computer. How does this work? First you have to know that DSLR cameras use phase based focus and not contrast based focus like the point and shoot consumer cameras. Phase based focus samples part of the image from opposite sides of the lens and matches them up on a narrow image sensor until the two images come into convergence. 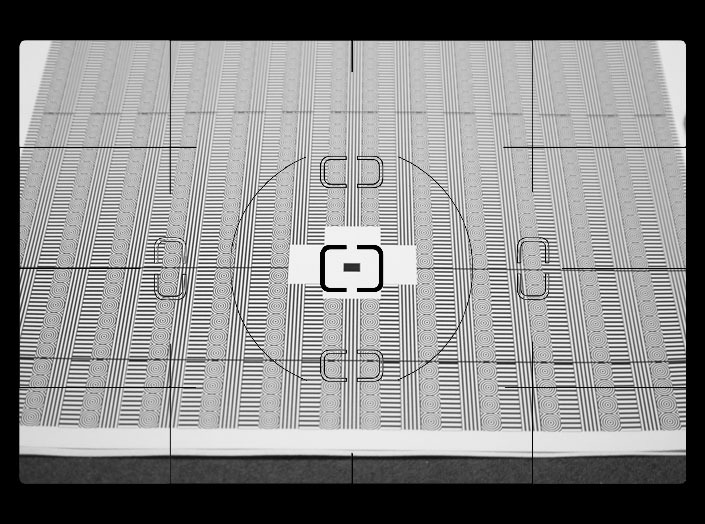 The actual adjustment made in the factory is a number that corresponds to the distance on the sensor from one image to the other. The advantage is that the sensor can tell immediately whether to focus in or out and approximately how far it has to go. The process is continuous and is repeated very rapidly until there is no error voltage generated. The most appropriate thing to focus on is a small black dot on a white field in bright light. Point and shoot cameras, however work best on many edges and transitions to develop their focus signal and they have no idea which direction to go, so they have to try and see if the contrast improves. To learn more about this phase adjusting process see this link. The Multi CAMxxx series of modules are used on most D class cameras and vary in the number of sensors and the method of grouping and selecting the sensors. Some cameras may be able to use lens data that comes from the computer chip in the lens to modify the way the sensor adjusts the focus forward or backward and use other information about image crossover distance and anastigmat characteristics. The details of this interaction is considered proprietary, so any guess I make as to how it works is simply that, my guess. I will start the guess by saying that the target I publish for this document will work on most D class of camera and lens. Materials were generated for the D70, but with modifications of instructions should work with them all. An optical system, with at least three elements, which is completely corrected for spherical aberration, coma, and astigmatism. Most of the inexpensive and kit lenses are not anastigmat. This characteristic is available in more expensive lenses. Many inexpensive lenses have a variety of astigmatism. The lens may not have a flat focus field. Using a tilted target may have increased backfocus the further off axis it is measured. The typical tilted target may have its indicator lines several inches to the left and right of center. All non anastigmat lenses will indicate backfocus under these circumstances. A lens may have cylinder astigmatism which means that vertical and horizontal lines do not focus in the same plane. Vertical lines may have more backfocus than horizontal lines. High quality prime lenses will generally focus very easily. Zoom lenses may demonstrate various astigmatisms at different focal lengths if the zoom lens rotates as it is zooming such as the 18-70 kit lens. The 28-200 lens, however has a flat focus field and does not rotate, therefore does not exhibit different focus errors while zooming. Extra design effort goes into zoom lenses that start at a wide angle. These lenses must have special designs to avoid barrel and pincushion distortion and therefor must sacrifice in the non obvious areas such as focus plane in order to be acceptable to the average user. This target is 8 by 10 inches. It may be printed on an ink jet or laser printer on glossy paper having a printer resolution of 300dpi native resolution. Two targets are available. One target is 300 dpi as a bilevel compressed TIF. The other is 600 dpi which can be printed on a laser printer. I have used card stock and photo paper with good results. Preparing to photograph the target. You can interpret this target with your naked eye, but it is much easier if you use the histogram feature in PhotoShop Elements 3 to 5. It has a feature called Standard Deviation which can indicate the sharpness of the target area to three digits of accuracy. This feature is not available on any other version of PhotoShop. More on that later. Use a tripod not only to prevent motion but because you want to set up the target to coincide with the markings in the viewfinder. You do not want the target to be twisted if you are going to be making precision observations. You should be using high quality daylight or diffused flash for exposure. If using flash, set the shutter speed to the highest permitted for flash. Set the camera to Manual. Set the flash to TTL. Set the aperture to f4 or the closest to f4 you can get if you have one of the kit lenses. Take your first shots at 50 mm focal length. Setting at F4 would be adequate even for a lens that opens wider. We are just going to find the sweet spot and see how close it comes to being OK. Set Manual or Aperture priority and make sure you are using the central focus sensor only. Set the focus lock to "L". (seen on the right) The target is designed to be used at 50 to 100 mm focal length and at about 1 to 2 feet. Use indirect or diffused daylight from a window if you can. If sunlight is not available consider using flash. 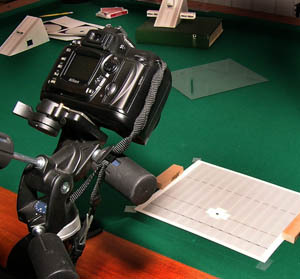 Your target is going to lay flat on a table and you are going to position the camera at a 45 degree angle +/- 15 degrees. Don’t get crazy about this. It is approximate and this is an easy test. If the target curls, consider using tape or a weight to hold it very flat. Watch out for refections if using glossy paper for the target. Try to shoot with the center vertical line aligned with the camera vertical line and the horizontal camera line perfectly lined up the horizontal target line. The ends of the dark line on the target should coincide with the circle in the viewfinder. You should be clipping the left and right edges of the target in the viewfinder. Take a shot or two to observe proper exposure. The whites should be white and the line patterns should not be blown out. If there are light reflections or shadows on the target, move things around until you get a clear, well exposed shot over the whole image area. Take some time now to map the sensor position so you know where it really is. Try to move the focus dot around in the focus rectangle and see where the sensor is. You should not be able to achieve focus when the black target spot is in the corners. Move the dot down from each top corner to see when the camera grabs focus. Move the dot up from the bottom corners to see when the camera will focus. Establish a mental image of where the sensor sees the black dot. The examples below use the red cross to identify the invisible sensor. Move the sensor from left to right from the corners to see the vertical cross bar. While focused on the horizontal bar, scan left and right to ascertain the location of the end points. Continue to map the lower dimensions. And lastly, confirm the end points. At this point you know where the sensor is pointing. Take a shot and bring it to your computer and note the pixel position of the center of the dot. Display the info pallete to note the x,y positions, change it to percent and note the address of the dot on the image. My camera indicates x=50% and y=50%. Your mileage may vary. Plus or minus 1% should not be a problem. Remember this number when you do busy field focus checks so you can locate the position of your sensor when evaluating focus. Busy field focus checks are for using brick walls and newspapers as focus targets. They are more like the real world but are not always consistent. That first shot you took of the focus target will look something like this. The concentric circles that line up with the focus dot and the horizontal guide line should be reasonably sharp the the image will be out of focus above and below that point. At f4 the circles immediately above and below the focus dot should show about the same degradation, but still be acceptable. You can actually measure and assign a value to the sharpness of the image by using a statistical analysis called "standard deviation". 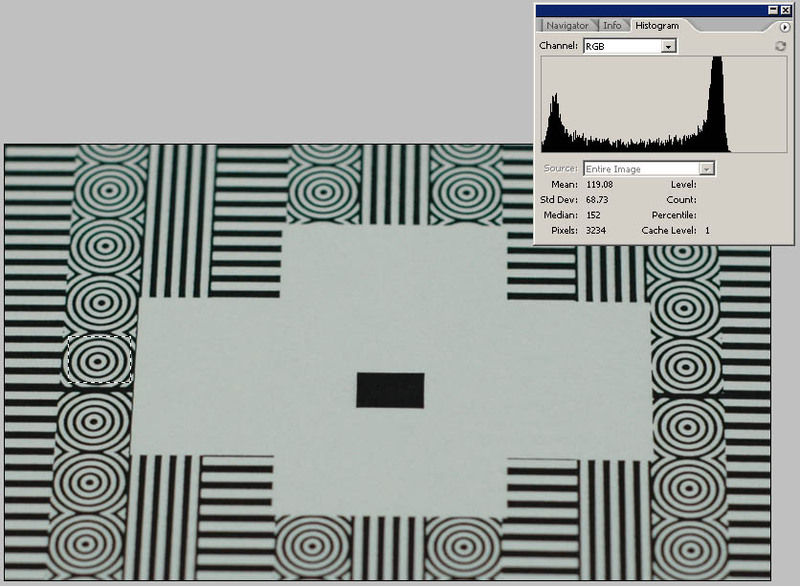 This feature is useful for measuring noise or sharpness associated with contrast. The higher the number, the sharper the image. We have not discussed exposure, but it would be best if the white was not maximum white, but about the value of 200 measured by mousing over the area and observing the values in the info pallete. Black should not be zero but about 20 for best results. I use a custom P&S curve. You may need to adjust the contrast to get those values. Standard deviation is available on Photoshop Elements by default, but Photoshop CS and above Require that you invoke some preferences to see the analysis. In the upper right corner of the histogram pallete is a small tab with a right arrow. Click on the arrow and a flyout window displays some options. Click Expanded View and Show Statistics. Photoshop will remember these options from here on out. 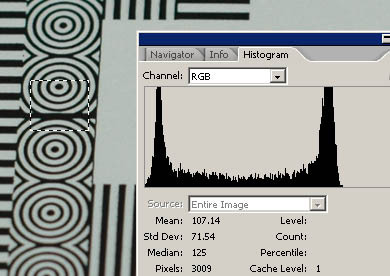 Unlike the Levels histogram which locks out image modification, the Histogram pallete remains active while doing other operations such as selecting portions of the image and marking the image. Although the source indicates Entire Image, the histogram only displays the selected portion of the image. This allows you to make a circle or square selection of the different patterns of the target to compare relative sharpness. Low values are poor and high values are better. This image has a rectangle selected for the circle to the left of the image. The Std Dev indicates 71.54. 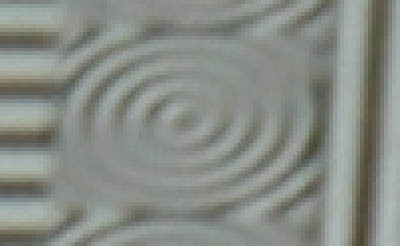 The top circle may measure 65 indicating less sharpness. Another important thing to notice is the shape of the histogram. There are two distinct spikes, one indicating black values on the left and the other indicating white values on the right. 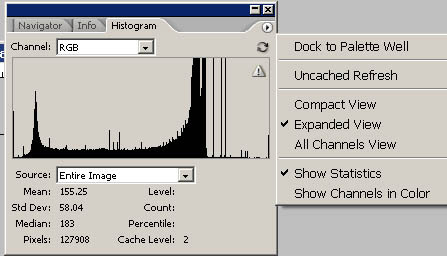 The middle of the histogram indicates the values at the edge of the lines, the values that are not the line or the space between the lines. The distance between the spikes show the contrast of the image. If you use an editor that does not have Standard Deviation, you could look at a selection of a histogram and get a good idea of the focus. This image shows an out of focus condition. The spike representing black is not there. What is happening here? Remember that we are working with positive images in digital photography. We are literally painting with light. If the image is out of focus the light is being scattered and it therfore goes to the black areas to reduce the blackness. It is light polution. This is the same target as above but the circle selected is further from the focus line. You no longer have to make a value judgement using your tired eyes. Out of focus now has a number. In this case it is 46.08. Even if you don't have Photoshop, you can interpret this chart with a histogram. What about the other patterns on the target? What are these for? Many people have believed thier camara was defective or had faulty focus when it was the focus test or their technique that failed them. Some lenses have undesirable characteristics that are caused by lens defects such as astigmatism and curveture of field. In order to detect these and other defects a variety of target elements have to be used. We have simplified the focus point ambiguity by using a simple square dot that will present only one large target to match on the phase detector focus module. The circles represent a combination of all angles of lines. Analyzing the circles should give you a reasonable focus measurement. The veritical and horizontal lines are used to detect astigmatism which could be an any angle depending on the angle of the focus lens, the zoom assembly or the barrel/pincushion elements of the lens. If the vertical and horizontal lines seem to focus at different distances, then you might have astigmatism. The most common correctable astigmatism is called "cylinder". If your eye has this defect you will not get the best results from drugstore reader glasses, but will require a prescription using a lens with some cylinder component to correct your eye. The distance off axis from the center is proportional to the error, so it is important to compare the focus quality near the center and also off at the side. Many of the targets, including my own previous target have failed to consider these conditions and have placed horizontal lines off to the side of a target tilted back and consequently caused people to believe they had a camera fault that needed correction. Let us look at a problem situation. The green dots indicate the point of sharpest focus for horizontal lines. The red dots show the sharpest focus for circular lines. The blue dots show the sharpest focus for almost vertical lines. This is the left side of the target. The right side is identical to this. This is the most popular lens sold with the D70. It is no wonder that there was a hysteria about back focus. This particular lens does not rotate the zoom assembly at different zoom ratios and the focus lens is in the rear, near the camera body. Other Nikon lenses like the 28-200 D rotate the zoom assembly and the focus lens is up front. The following image was taken at 70mm with the 18-70 kit lens. The busy field focus was used and the focus sensor has been drawn in for reference. There is a decided backfocus with this lens, but the horizontal line focus actually moved closer to the focus point near the edge of the image. This would have looked OK as far as the horizontal line sharpness on the Tim Jackson target but you would not have been able to accept the center image at "FOCUS HERE" on his target. In all fairness my own previously published target would have done the same thing. One or more lenses in a product may have slight astigmatism. When you stack lenses in an assembly they may be at any angle and add or subtract over a 90 degree range of rotation. My particular kit lens did not seem to be a problem with the typical 45 degree tilt target on horizontal lines. Somebody else having a different rotation of the lenses may have had a severe backfocus problem. It is not clear in my mind whether these situations are manuacturing defects or design errors. The astigmatism causing this problem appears to be cylinder, however the upper right side of the image shows a different axis. In this extreme blowup of the circles target taken from the upper left part of the image the circle appears OK at 4 oclock and 10 oclock and very bad at 1 oclock and 7 oclock. This distortion seems to relate with lens correction to correct linearity (change barrel to pincushion) for the wide angle lens. Here is another lens, the Nikon 28-200 DX. This lens rotates the zoom assembly so it may show different problems depending on zoom. This is the full width busy field focus test and shows a slight front focus near the center but a decided back focus of vertical lines near the edges. This is the Nikon 50mm f1.8 lens at f4. It is sharp, clear and high quality all along the flat focus plane. Next image is wide open. At f1.8 the image suffers from lack of contrast due to light scatter and a predictable shift in focus caused by using an aperture area over four times larger than the f4 image. The black dot is the computed center of the focus sensor. This busy field shot shows a little backfocus in the center and a gradual shift to being on focus nearer the edges. This is a demonstration of the curveture of focus field common in inexpensive glass. As a general rule, astigmatism is more common in zoom lenses, not primes. The more expensive the glass, the better the performance. Really wide open lenses lose contrast due to light scatter and may shift focus when stopped down. If you are someone that wants to manually focus the camera, you may want to repeat the test again for ten repetitions with the auto focus switch turned off. If this fails to give you consistent results, it may or may not be the fault of the camera. We will discuss that in Part 2 or you can just forget about manual focus for a while. If you are not satisfied with the focus at this time go to Part 2. I have not suggested testing wide angle lenses for two reasons. 1) Wide angle lenses have such a long depth of field that sweet spot focusing is hardly neccessary. 2) The nature of wide angle photography is that detail is not the purpose of the picture and is very hard to evaluate considering the distortion caused by maintaining a square image. See Part 4 of this series for explanations of hyperfocal distance. It is my belief that you should not try to autofocus wide angle lenses. They work best when focused at intermediate distances in most cased. There are exceptions of course, the goofy shots taken right into a person's nose calls for autofocus.